Hardwood flooring is an extremely popular flooring choice for homes all around the world. The look and feel of natural wood is unmatched by synthetic materials, and the flooring can stand the test of time with proper maintenance. Many homeowners choose to install new hardwood flooring to not only give their home a new look but provide the best resale value as well. Installing hardwood flooring is certainly a task that can be hired out to qualified contractors, but someone with moderate handyman experience and tool knowledge can perform the install themselves, helping to save themselves some money in the process. This guide will provide an overview of the main DIY hardwood floor installation method, as well as the hardwood floor installation tools required to do so. 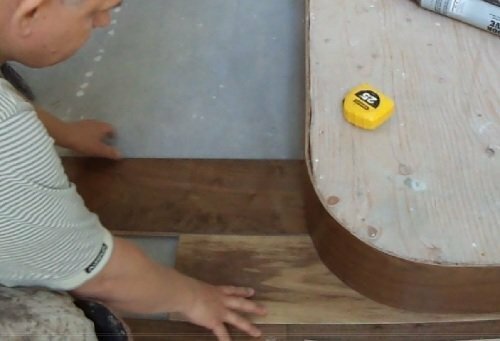 This flooring installation method involves nailing the boards to the subflooring and underlay. Begin by putting down underlayment. Start your floor layout at the longest wall that is parallel to the floor joists. Measure out the width of a one of your floorboards at the end of your each wall in the room, and then add 3/4 inches. Make a mark. Drive nails into the marks between them and use this to lay out the first row of boards. After doing this, pre-drill the nail holes into your endboards. Your main boards will be nailed through the tongue, but these boards will be nailed through the face, so pre-drilling will help to avoid splitting. Line up your first board against the wall with the layout line you’ve created with a ¾ inch spacer in between. Nail the board with either 6d or 8d flooring nails, and make sure the tongue is facing away from the wall. Lay out your boards in random order, avoiding any color or pattern groupings. Arrange the boards so that their joints are randomly offset as well. This creates a cohesive look without concentrating one color in an area. Put the first board of the new row in place, and make sure it is offset from the end of the previous board by at least 6 inches. Drill pilot holes in the tongues of the boards, and then drive nails through each hole. Do this for a few more boards, until you have room to work with the flooring nailer. 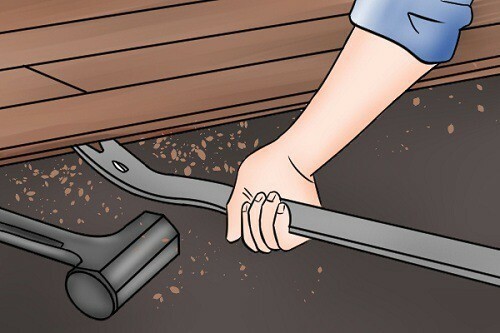 Once you have room for the flooring nailer, position the nailer where the nail is angled to drive through the tongue of the board. Strike the release button with a rubber mallet to get the gun to fire the nail. Work your way across the room, making sure to keep the boards at varying lengths and color. At some point you will encounter things like vents, doorways, and corners. Using a pencil, mark off portions of boards that need to be sawed to fit these spaces. Saw the board, and install using the same methods as described above. 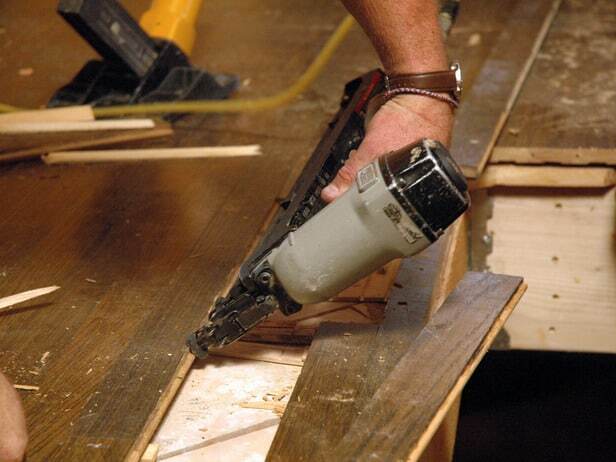 As you get close to the other walls, you may run out of space to use the flooring nailer. Use the pilot hole method that you utilized when first starting, and finish the installation. You may have to cut the final boards to fit between the other board and the spacers. Use the pry bar to pull the final board towards the others if necessary. Once the final boards are installed, you may reinstall the molding or edging that you removed prior to the installation. 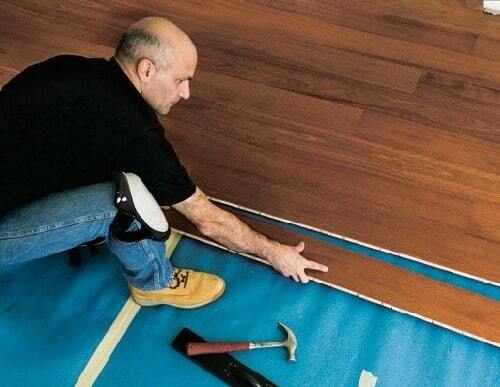 A floating floor installation is an easier and faster way to install a hardwood floor that also requires less tools. This installation is not only simpler, it makes removal easier as well if the time comes. One drawback to this method is the fact that the floor is not actually adhered to the subfloor, which could present some problems down the road. As far as tools are concerned, you’ll need everything but nails guns, drills, and the nails themselves. You will need wood glue, however. Your preparation will be the same. Ensure that the wood is acclimated, and also make sure that the sub-flooring is solid and even. Remove any molding and trim, put your underlayment down, and you’re ready to go. Make sure your boards are all cut in varying lengths, and laid out in varying color shade and patterns to achieve cohesiveness. Take your first board, and line it up along the longest wall in the room, using your spacers in between. When the board is secure and snug, apply wood glue to the tongue, and attach your next board to it. Wipe off any excess glue with a damp towel. Repeat this process across the room, until you’ve reached the other side. Cut the final board to fit if necessary, and reinstall your moldings and wall trim. 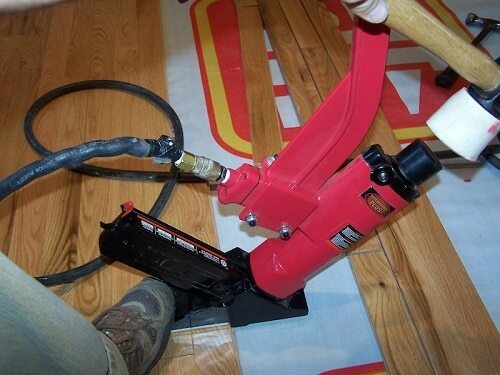 DIY flooring installations aren’t for everyone. 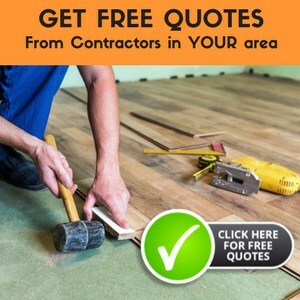 Sometimes it makes more sense to simply pass the task off to someone who is qualified, and can ensure a quality job without risking your flooring materials. Sure, it will cost you, but the peace of mind and time saved can be priceless. So how much will a hardwood flooring installation set you back? That depends on the materials used, as well as your home’s square footage. While this varies from home to home, Home Advisor states that the average amount per household in 2016 is $4,398 per installation, including materials.